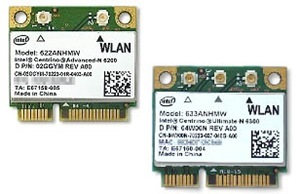 The Intel® Centrino® Ultimate-N 6300 and Intel® Centrino® Advanced-N 6200 are a family of IEEE 802.11a/b/g/n wireless adapters that operate in both the 2.4 GHz and 5.0 GHz spectra. These adapters are available in a PCIe Half Mini Card* form factor and deliver up to 450 Mbps of bandwidth; in addition to providing a host of features that enhance today’s mobile lifestyle. For business users, the Intel Centrino Ultimate-N 6300 and Intel Centrino Advanced-N 6200 products enable remote wireless manageability, resulting in lower administration costs combined with a predictable and reliable wireless connection. NOTE: Use the EXE file for automated driver installation.